Sutherland JM, Repin N, Crump RT, Hellsten E. Paying for Hospital Services: A Hard Look at the Options. CD Howe Institute, 2013. Lui G, Repin N, Sutherland, JM. Activity Based Funding in British Columbia: Changes in Activity? Association of Health Services and Policy Research (CAHPSR) Annual Research Meeting, Vancouver BC, 2013. Sutherland JM, Repin N, Crump RT. Reviewing the potential roles of financial incentives for funding healthcare in Canada. Canadian Foundation for Healthcare Improvement, 2012. Sutherland JM, McGrail K, Law M, et al. British Columbia hospitals: examination and assessment of payment reform (B-CHeaPR). BMC Health Services Research, 2011. Sutherland, JM. Hospital payment mechanisms: An overview and options for Canada. Canadian Health Services Research Foundation, 2011. A Primer on Activity-Based Funding. Canadian Institute for Health Information, 2010. Street A, Vitikainen K, Bjorvatn A. et al. Introducing activity-based financing: A review of experience in Australia, Denmark, Norway and Sweden. Centre for Health Economics. University of York, 2007. Canadian Medical Association. CMA supports patient-based funding model. Journal of the Canadian Medical Association, 2008. British Columbia Medical Association. Waiting too long: reducing and better managing wait times in BC: A policy paper by the BCMA’s Council on Health Economics & Policy. British Columbia Medical Association, 2006. Activity-based funding (ABF) is a method of funding healthcare where providers are allocated funds based on the type and volume of services they provide, and the complexity of the patient population they serve. 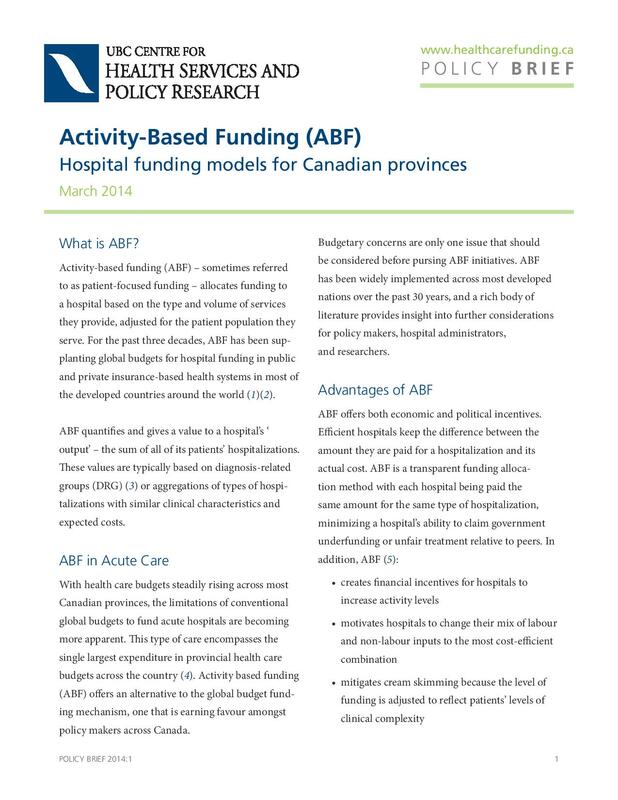 ABF has become the international norm for funding hospital-based care, and is referred to by many terms, such as patient-focused funding, service-based funding, case-mix funding or payment by results (Sutherland & Repin, 2012). Under ABF, a hospital’s revenue is linked to its activity and patients are thus a source of potential income. Hospitals that can increase their volume of services can benefit from increased revenue; however, volume increases are only possible if there is unused capacity or if additional capacity is generated by improving efficiency, or by discharging patients to other care settings. The most common policy objectives for the implementation of ABF are to create incentives for increasing productivity, efficiency and to improve transparency in funding (Sutherland & Repin, 2012, Busse, Geissler, Quentin, & Wiley, 2011). Under ABF, all hospitals are paid the same amount for each hospitalization type. ABF quantifies hospital outputs by use of classification systems; one of the original methods being diagnosis-related groups (DRG) (Moreno-Serra & Wagstaff, 2010). Each DRG represents clinically comparable hospitalizations with similar expected costs, and ABF pays hospitals based on the value associated with the assigned DRG (Sutherland & Repin, 2012). ABF has also been used to address specific policy objectives, such as reducing wait lists, increasing hospital quality, encouraging competition among hospitals and enhancing the monitoring of hospital activity.